This 5.19 ct CVD synthetic diamond (10.04 × 9.44 × 6.18 mm, with J-equivalent color and VS2-equivalent clarity) is the largest GIA has identified to date. Photo by Johnny Leung and Tony Leung. Chemical vapor deposition (CVD) technology has accelerated over the last several years, and the rapidly improving techniques have produced large, high-quality near-colorless and colorless synthetic diamonds. Two samples over 3 carats were reported in early 2016 as the largest CVD synthetics. GIA recently tested a CVD-grown synthetic diamond that weighed over 5 carats, marking a significant milestone. The 5.19 ct cushion modified brilliant measuring 10.04 × 9.44 × 6.18 mm was submitted to GIA’s Hong Kong laboratory for grading service. The stone was not disclosed as a synthetic diamond. Using the lab’s standard screening and testing processes, it was identified as CVD synthetic. Following examination, a GIA Identification Report was issued and the stone was inscribed on the girdle with the report number and the words “Laboratory Grown,” following GIA’s protocols for undisclosed synthetics. I will be writing more on the subject of lab grown diamonds in the coming days. If you are interested in the subject I would encourage you to join my mailing list! Red, pink, lilac, and blue are commercially important spinel colors. If you are an August baby that has bemoaned your peridot birthstone in the past you're in luck. this year the American Gem Trade Association (AGTA), the authoritative source on natural colored gemstones, and Jewelers of America (JA), the national trade association for businesses serving the fine jewelry marketplace, have announced that spinel will join the official list of birthstones as an additional gemstone for the month of August. The new birthstone launched to consumers in July, through a public relations and marketing campaign led by JA, which established the modern birthstone list in 1912. "At certain moments in history, when there is a strong call from gem enthusiasts to expand the list of official birthstones, Jewelers of America believes in recognizing the importance of historically significant gemstones and giving gemstone lovers a choice that suits their preferences," says JA President & CEO David J. Bonaparte. 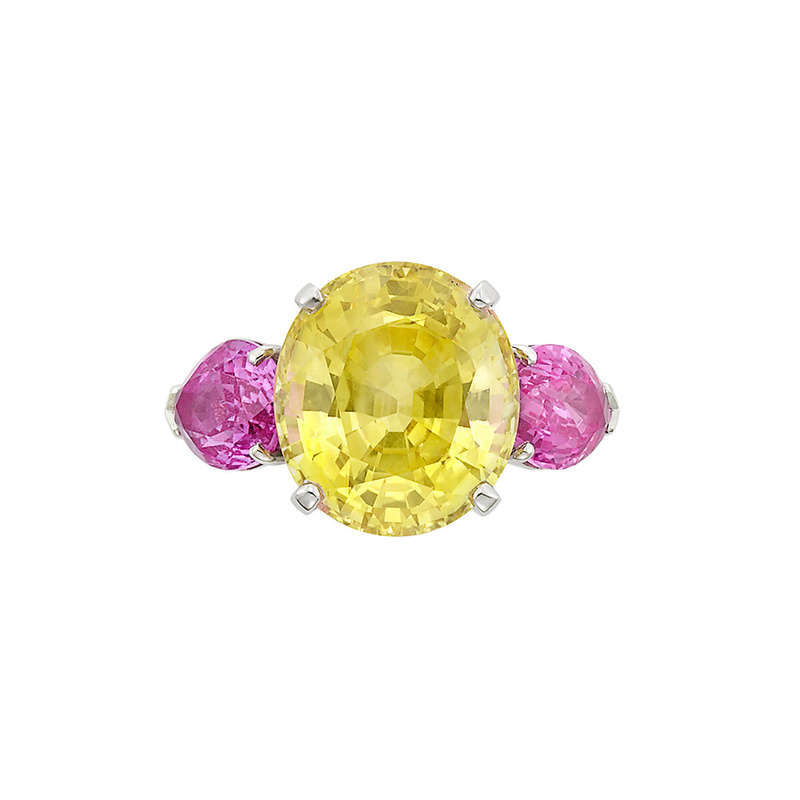 "Spinel is a welcome addition to August's peridot birthstone, sure to be embraced by both jewelers and the jewelry consuming public." "Ancient gemstone merchants revered spinel, and it was widely sought after by royalty. It was then known as 'Balas Ruby'," says AGTA CEO Douglas Hucker. "It wasn't until the late 18th century that we developed the technology acumen necessary to distinguish spinel as a separate mineral from ruby. 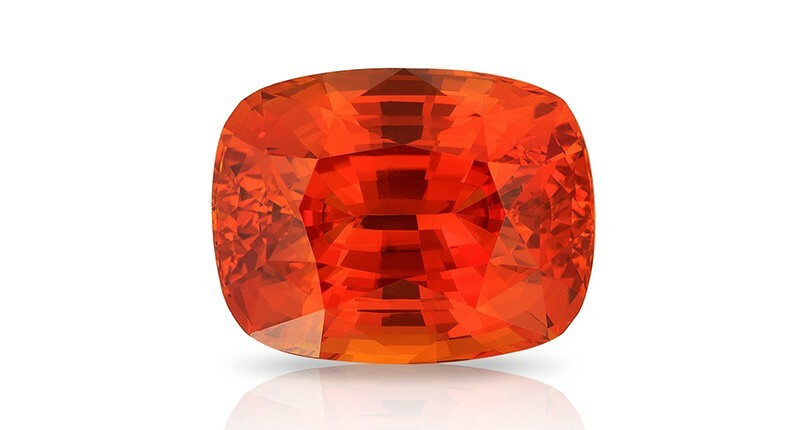 We are very excited to announce it as the newest member of the official birthstone list." Two notable examples of spinel's historical significance include a 170-carat red spinel, known as the famed "Black Prince Ruby," that graces the Imperial State Crown in the British Crown Jewels; and a 398-carat red spinel - considered the largest ever found -atop the Imperial Crown of Russia, commissioned by Catherine the Great in 1763. "Spinel is an incredible gemstone that has garnered respect for centuries, and it is enjoying surging popularity because of its stunning range of colors," remarks AGTA President Jeffrey Bilgore. "Birthstones have their roots far back in recorded history, strongly influenced by biblical teaching and related to the 12 stones in the breast plate of Aaron as well as the lunar calendar," explains Hucker. 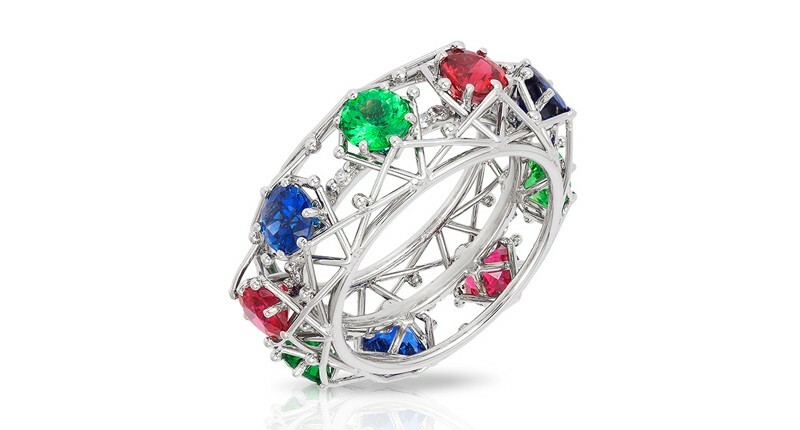 This is the third update to modern birthstone list since it was officially created in 1912 by the American National Retail Jewelers Association, now known as Jewelers of America. It was updated in 1952, adding alexandrite, citrine, tourmaline and zircon as birthstones, and again in 2002, when Tanzanite was made an additional December birthstone. This suite of round brilliant demantoid garnets weighing 24.67 total carats won Best of Show in this year’s AGTA Spectrum Awards. Judging for this year’s Spectrum Awards took place Saturday and Sunday in New York. For the first time the competition was held in the summer rather than the fall. This was the second year in a row that an entry in the 'Cutting Edge' category took best in show. The design contests highest honor was given to a suite of round brilliant Russian demantoid garnets weighing a total of 24.67 carats cut by Ruben Bindra of B&B Fine Gems (see above photo). This year’s judges were: Gail Brett-Levine of National Association of Jewelry Appraisers, Diane Garmendia of 33 Jewels at El Paseo, Jay Mednikow of J.H. Mednikow & Co., Inc. Victor Velyan of Victor-Christy Studios and Lew Wackler of Lew Wackler Gem Co. The winners will be receiving their awards during the 2017 AGTA GemFair in Tucson (Jan. 31 to Feb. 5) at the Tucson Convention Center. Winning entries will be displayed during the show and the award winners will be recognized during the Spectrum Awards Gala on Feb 4. Ricardo Basta of E. Eichberg Inc. won First Place and Platinum Honors for this platinum “Royal Blue” ring featuring a 12-carat blue sapphire accented with diamonds. The ring also has a detachable 18-karat yellow gold “Quilt” jacket--creating a ring within a ring--featuring turquoise accented with diamonds and tsavorite garnets. 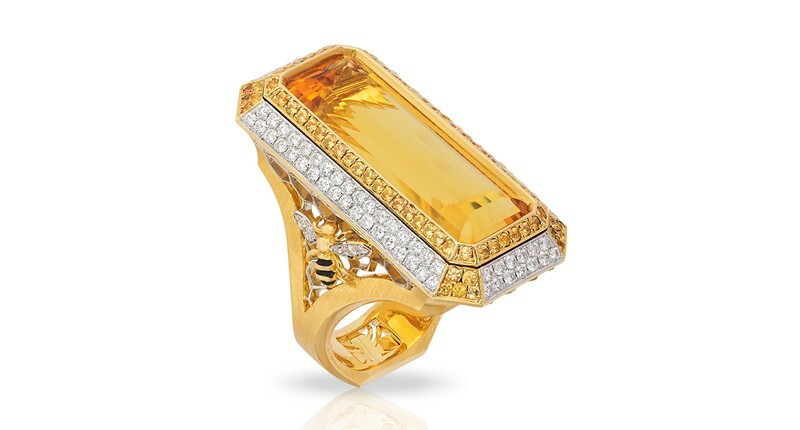 Ricardo Basta of E. Eichberg Inc. also won First Place in the Business/Day Wear category with this 18-karat yellow gold and platinum “Honey” ring featuring a 13.58-carat Heliodor accented with sapphires and diamonds. Niveet Nagpal of Omi Gems won first place in Classical with this 18-karat rose gold ring featuring a 4.01-carat cushion-cut pink spinel accented with spinel and diamond melee and a 0.01-carat alexandrite. The first place winner was David Gross of David Gross Group for this platinum necklace featuring 21 unheated Mozambique rubies weighing 29.33 total carats accented with 21.61 carats of diamonds. 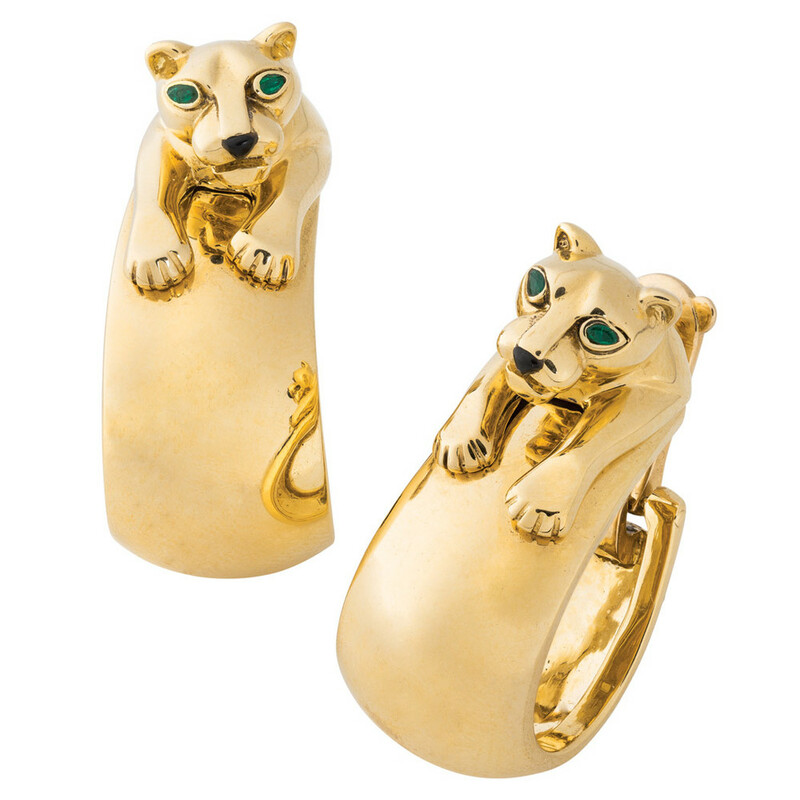 Mark Schneider of Mark Schneider Design won First Place and Platinum honors for this platinum and 18-karat yellow gold ring featuring an 8.76-carat Maw Sit accented with black, white and yellow diamonds and tsavorite garnets. Best Use of Platinum and Color: Kathy Kinev, Jewel Creations Inc.
First Place and Platinum Honors: Ricardo Basta, E. Eichberg Inc.
Gem Diva Award: Heena Chheda Shah, Real Gems Inc.
First Place: Ricardo Basta, E. Eichberg Inc.
First Place: Niveet Nagpal, Omi Gems Inc.
Second Place: Niveet Nagpal, Omi Gems Inc. Honorable Mention and Gem Diva Award: Heena Chheda Shah, Real Gems Inc.
Manufacturing Honors: Dominique Israileff, ASBA USA Inc. Honorable Mention: Erica Courtney, Erica Courtney Inc. The winners for the Cutting Edge Awards are as follows. Second Place: John Dyer, John Dyer & Co.
Second Place: Allen Kleiman, A. Kleiman & Co.
Third Place: Allen Kleiman, A. Kleiman & Co.
First Place: John Dyer, John Dyer & Co. Honorable Mention: Glenn Wm. 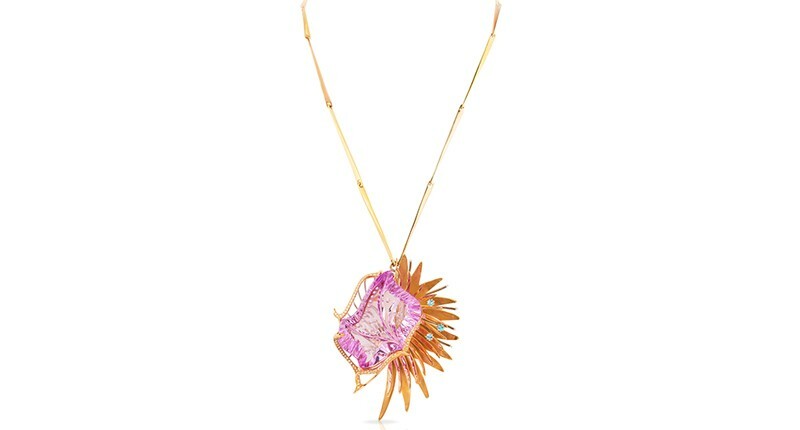 Lehrer, Lehrer Designs Inc.
Third Place: Ben Kho, Kho International Ltd. Honorable Mention: Allen Kleiman, A. Kleiman & Co.
Third Place: Manu Nichani, Blue Moon Ent. Honorable Mention: Robyn Dufty, DuftyWeis Opals Inc. Honorable Mention: Hemant Phophaliya, AG Color Inc. Continuing the westward move of auction houses Doyle will hold its Inaugural West Coast Auction in Beverly Hills on Thursday, May 21, 2015 at 10am. These important sales address an entire demographic that has been ignored in the past by the established Eastern houses. The sale of Fine Jewelry will feature exquisite designs by such prestigious makers as Van Cleef & Arpels, Cartier, Bulgari and Tiffany & Co. Comprising over 250 lots, the sale showcases jewelry set with diamonds, colored gemstones and pearls, as well as gold jewelry, fine watches and gentlemen's accessories. 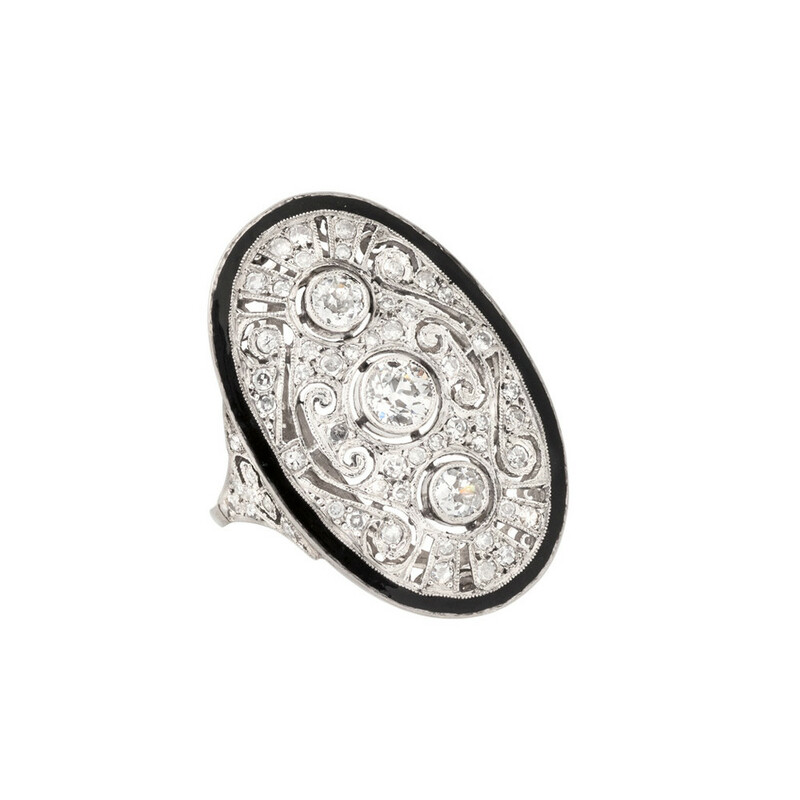 One star of the show will be the dazzling collection of jewelry once owned by film star Mae West, comprising a circa 1950 platinum and diamond bracelet-watch by Fred and a platinum, moonstone and diamond ring. The “Dreams of Diamonds” exhibit will be on view at the Gemological Institute of America from April 29 to May 11. It will feature 25 diamond pieces, including a pair of boots set with 1,527 carats of diamonds and a 50.05-carat flawless D-color diamond. More than 4,000 carats of diamonds will be on display. The exhibit coincides with a debut of a book on these stunning and unique pieces. The book was put together by British photography and design team Alastair Laidlaw and Christine Marsden. It is a massive oversized ‘Super Book’ that features full print size images and weighs more than 30 pounds. The book took six years to complete, featuring the diamonds and jewelry in unusual, “dream-like” settings. 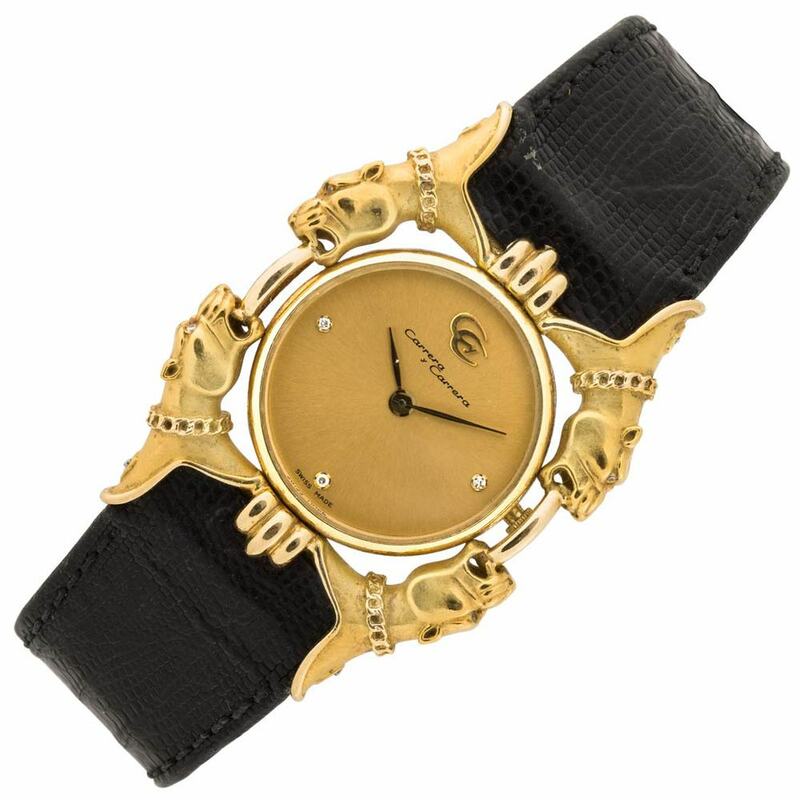 The items featured in the book were provided by 12 of the world’s best-known diamantaires and designers. 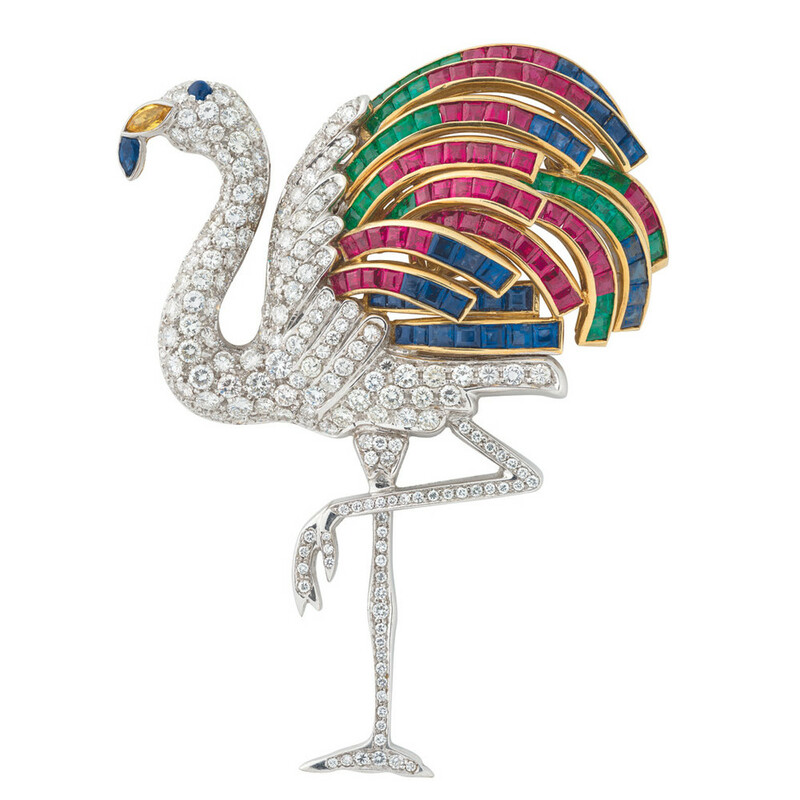 Seven of them: Adler Joailliers, Chatila, Chow Tai Fook, Diacore, Mouawad, and Munnu The Gem Palace, are loaning pieces for the exhibit at GIA. Appointments are necessary to see this exhibit. Head to GIA’s website for details. The November 12th, 2014 Sotheby's Geneva auction was lead by a truly magnificent pigeon-blood colored ruby known as the "Graff Ruby". The ring was originally sold at auction nine years ago and was purchased by noted jeweller Laurence Graff for a record breaking price. He later named the ruby "The Graff Ruby". In Geneva the ring again fetched a record breaking amount (selling for $8,600,410). 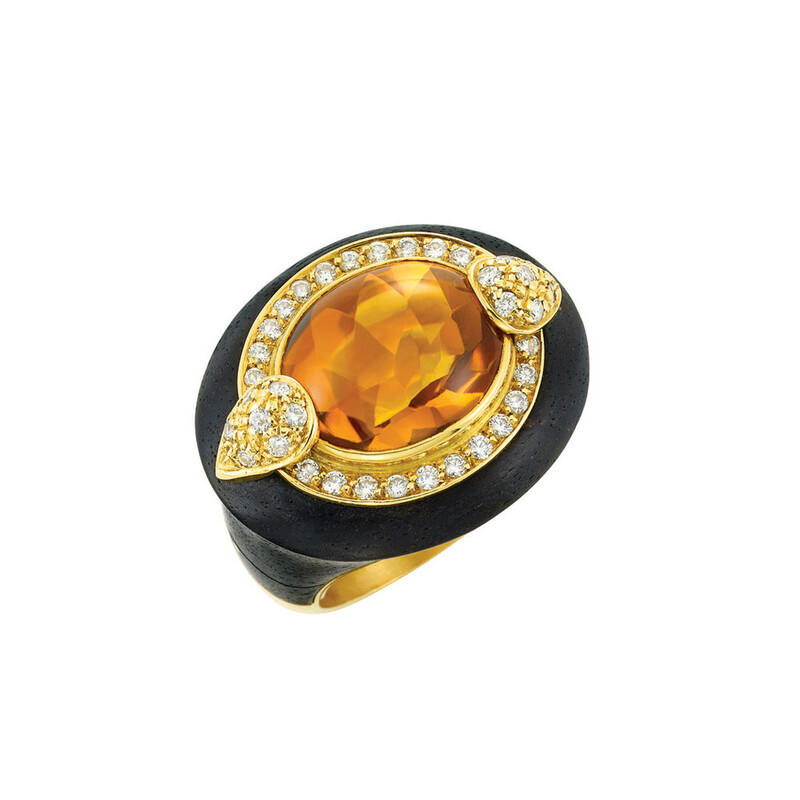 The ring was part of the Collection of Dimitri Mavrommatis (16 pieces) which also included a rare 27.54 carat step-cut Kashmir sapphire, as well as several pieces by contemporary jewelers, Graff and JAR (who was represented by a pair of superb sapphire, ruby and diamond earrings). "The Graff Ruby...The described gemstones exhibits an impressive weight and purity, combined with a very pleasant shape and cutting style. The faint inclusions found by microscopic inspection represent the hallmarks of the reputed deposit of Mogok in Burma (Myanmar). The stone has been spared to exposure of thermal treatment and its clarity and colour are natural. Its vivid red, poetically referred to as 'pigeon blood' is due to a combination of well balanced trace elements in the stone, typical and characteristic for rubies of the Mogok gemstone tract. Natural Mogok rubies from this size, colour and clarity represent a great rarity and the Graff ruby with its combination of outstanding characteristics is a very exceptional gemstone." The Christie's November 11th auction shatters the world record for any sapphire sold at an auction with the Blue Belle of Asia fetching a staggering US$17.7 million. The 392.52 carats cushion-cut Ceylon sapphire is the world’s fourth largest faceted blue sapphire and was listed as the second most expensive lot at the sale (estimate $6.9 – 9.9 million), however it soon outperformed the highest estimated lot, colored diamond and diamond ear pendants by Bulgari. The enormous blue sapphire has a provenance dating back to 1937. This is an even larger landmark notice as this was also the first time that a blue sapphire or a colored gemstone lot had been at the top of a public auction and outperformed diamond containing lots.